Mass death in the animal kingdom is not an unusual occurrence, but it is one shrouded in mystery. There are many reasons that a mass animal death could occur, ranging from natural disasters, like disease or lightning storms, to anthropogenic disasters like oil spills or climate change. In some cases, the cause of death remains unclear. Most recently, however, mass deaths are becoming more common and are attributed to climate change. Samuel Fay and his team examined mass animal deaths from 1940 to 2012, which was 727 mass death events. They found that as time progressed, mass deaths became more frequent for fish, marine invertebrates, and birds while land animals remained unchanged. The researchers noted that these changes could be true changes or simply perceived increase due to bias as more time and research would be needed to come to a definitive conclusion. Nevertheless, they were able to extract some answers to this increase. They found that along with the increase in mass death, there were also increases in biotoxicity, like red algae bloom, diseases, and human-based disturbances. As the ocean waters get warmer due to climate change, red algae bloom become more frequent as they thrive in warm waters. The warmer waters also result in the expansion of the areas that diseases can live in, thus expanding the number of new organisms they can infect. Human disturbances, like large amounts of plastics in the ocean, can also cause diseases to spread as they result in weaker ocean life. While it is important to understand the effects climate change has on mass deaths and the resulting consequences to humans, it is also important to understand the effect these mass deaths have on the ecosystem as well as their relationships to invasive species. That is the focus of Brandon Barton and his team as the study the effects of 3-ton of dead pigs. The researchers used feral pigs for their experiment that were killed via culling. These pigs are the same pigs found in farms, but they have been released into the wild, on purpose or accidentally, and have become feral. Pigs are not native to the United States and they were brought here in the 1500s by explorers and settlers wanting to use them for food and resources. They popularity is obvious in the United States with our obsession with bacon and other pig products. Feral pigs are anything but popular. They are an invasive species that enters ecosystems and cause extensive damages. They are also dangerous and pose a threat to humans and other animals. They cause about $1.5 billion dollars in damages every year. They have been found in 35 of the contiguous states and they continue to spread to other states, thus increasing the damage they do over time. It was the perfect choice for Barton and his time to use for this experiment. 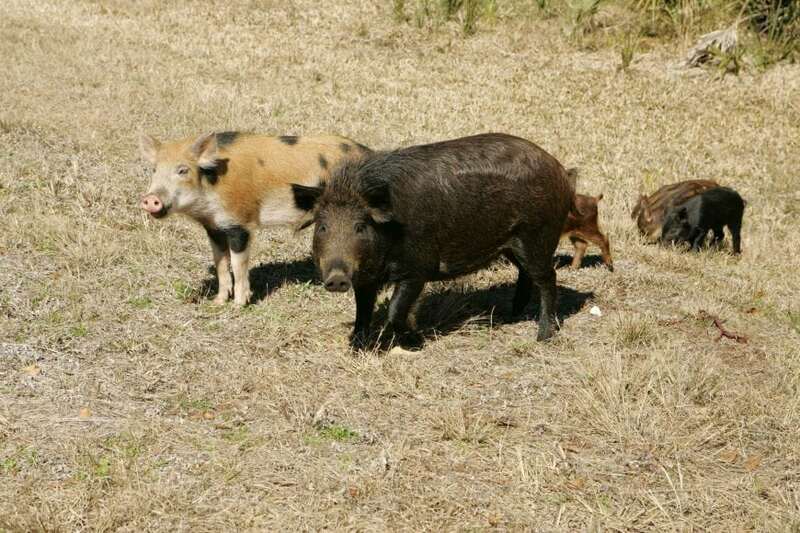 The researchers gathered about 3 tons of the feral pigs and placed in a plot of land, given to them by Mississippi State University. They took measurements of the land before placing the pigs with the hopes of conducting an extensive before and after analysis. Their samples were immediately assaulted by maggots and vultures, each vying for the rotting pig corpses. The researchers collected bacterial samples from the rotting pigs and attempted to collect leaf samples, but had to abandon that due to the massive amounts of decomposed pig gunk all over everything. The maggots disrupted traps the researchers had set up for insects and the resulting flies brought hornets, which brought other predators. In the end, the ground was completely disturbed and changed by the numerous disturbances of insects and animals. Most of the plant life was killed off, creating a vacuum for other plants to enter. Barton and his team speculated that the land would take a very long time to recover or never recover at all. The researcher’s conclusions were straightforward: the mass of decaying pigs was an ecological mess as well as being a problem in extracting data from. Such mass deaths, resulting from natural causes or culling, creates a problem for the ecosystem that they die in. They can attract flies that bring diseases, increasing the odds of more animal deaths. They result in the ground being unsuitable for previous inhabitants. And, they cause a vacuum that could be potentially filled by invasive species, creating even more of a problem. The feral pigs that were culled prevent the economic and ecological problems that they created, but when they are culled in such numbers the results can be worse than the initial problem. The instability that is created by mass deaths is perfect for invasive species because they weaken the native plants and lower their ability to survive against their invasive other. Barton and his team are not done with their research. They must now begin a phase two, where they study the recovery of the ecosystem the rotting pigs wrecked. This recovery period is important to understand as it will affect how we approach conservation efforts in areas that experiences mass deaths. One aspect of recovery that is crucial to understand is invasive species. The ways in which invasive species succeed in this chaotic environment during recovery would teach us how to combat them in other places both on land and under the sea. As the oceans are the ones that are experiencing both invasive species and an increase in mass deaths along with climate change, it is important that we create experiments similar to this in ocean environments. The results will be crucial in stopping invasive species and potentially pinpoint areas recovering from mass deaths or experiencing them. We would also begin to understand the relationship between climate change and invasive species as these species stand to gain a lot from disruption of environments they want to expand into. Previous Post« Previous Do Sports Fans Connect More With Endangered Species Mascots?